Some Canadian rivers are at risk of drying up as impacts of climate change intersect with growing water demand from the country's cities, industries and agriculture, a new WWF report has found. Toronto, Canada - Some Canadian rivers are at risk of drying up as impacts of climate change intersect with growing water demand from the country's cities, industries and agriculture, a new WWF report has found. Canada's Rivers at Risk: Environmental Flows and Canada's Freshwater Future uses a scientific approach that focuses on the importance of water flow to examine the health of 10 Canadian rivers and reveals that some are dangerously close to drying up. It concludes that Canadiaqns must value their fresh water differently and take immediate action to protect it. Among the rivers at risk is the mighty Mackenzie, one of the world's longest free flowing rivers but one which also rises where climate change impacts are most pronounced. To complicate the river's future, climate change also contributes to another looming threat - increased interest in low carbon hydropower development along the river. Growing water withdrawals from industries such as oil sands development also pose threats. A more encouraging picture comes from the Nipigon in Ontario, once stifled by dams and power development consuming all but three metres of its 95 metre drop from source to Lake Superior in the Great Lakes. Now the dams are operated to restore flows to more natural conditions, and fish populations are showing strong signs of recovery. Using sophisticated flow analysis that looks at the timing of flows and the water needs of river ecosystems yields much more valid assessments of river health than just counting up overall quantities of water, said Tony Maas, Director of Fresh Water for WWF-Canada. "Looking at environmental flows forces us to look at the scale that matters most when it comes to fresh water - the watershed," Maas said. "When we do, we find that growing more food, generating more electricity, quenching the thirst of expanding cities, and fuelling industry, are taking their toll on the nation's rivers and converging with the adverse impacts of climate change. "Even seemingly remote northern waters like the Mackenzie are at risk. As temperatures rise, and industrial water withdrawals and interest in hydropower increase, we must start planning now to protect river flows to ensure water security for the communities and economies that depend on them." The report recommends a much stronger role in Canadian water stewardship for Canada's Federal government. "The Mackenzie River is emerging as a national priority for freshwater conservation and the federal government can play a much stronger leadership role in protecting the waters of this vast watershed by facilitating implementation of the Mackenzie River Transboundary Water Agreement," said Maas. This will ensure increasingly intensive development in upstream jurisdictions does not impair the health of the river, and the communities, downstream. " To avoid irreparable damage, there must be a long-term plan to keep rivers flowing for people and nature. This includes strong federal leadership to address climate change - both at the UN Climate Conference this December, as well as in implementing a credible, national action plan to reduce emissions and put strategies into place for adapting to a changing freshwater future across Canada. "These issues are of a scope and scale that require national leadership on fresh water in Canada now," said Gerald Butts, President and CEO, WWF-Canada. "Water is our most important national resource. Our responsibility is to steward it wisely to ensure that future Canadians can benefit from it as we do today." Skeena River - supports Canada's second largest wild salmon fishery (worth $110 million annually). Proposed development of mines, coal bed methane fields, oil and gas pipelines, and run-of-river hydropower projects could significantly affect the Skeena's natural flow and potentially compromise the watershed's incredible biodiversity and ecosystem functions. 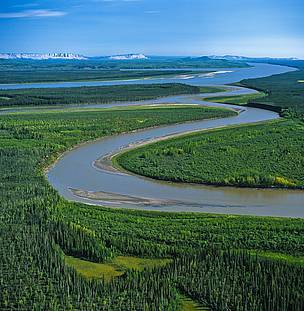 Mackenzie River - is one of the world's longest free flowing rivers and plays an important role in regulating ocean circulation and climate. The Mackenzie watershed has experienced greater temperature increases than anywhere else in Canada which further impacts flows, and growing interest in hydropower development is an emerging threat. Fraser River - contributes to 80 per cent of the province's economic output and produces more salmon than any other river on earth. Its fishing industry is worth over $300 million annually. Major dams on the Fraser's tributaries, drainage for flood control, and withdrawals for agriculture and urban use have compromised flow within the watershed. Athabasca River - provides the greatest direct inflow of water to the world's largest boreal freshwater delta - the Peace-Athabasca Delta. Together, the river and the delta support over 30 species of fish and more than a million migratory birds each year. Water withdrawals for industry amount to more water than is used by the city of Toronto each year. The amount of water taken for development is projected to increase by at least 200 per cent by 2015. Nipigon River - was once a turbulent river but now its flows are highly regulated. Only three meters of its original 95-metre vertical drop remains unharnessed by dams. However, it is a great example of what is possible in terms of restoring river health - even in the face of significant threats. Operation of hydropower dams on the river have been improved to restore flows to more natural conditions, and the ecosystem and fish populations are showing strong signs of recovery. South Saskatchewan River - is Canada's most threatened river. Hundreds of dams exist throughout its watershed and 70% of the flow is withdrawn for agricultural and urban use. The water scarcity typical of the region's arid climate is expected to intensify under climate change, which experts describe as an emerging water crisis. Grand River - is one of the most regulated rivers in Canada - more than 100 dams and control structures along the Grand and its tributaries have significantly altered the river's natural flow regime. Increased demand for water to supply growing cities is a growing threat. St. Lawrence River - drains water from the world's largest freshwater ecosystem, the Great Lakes. Its natural flow has been drastically altered and is currently in a declining state due to numerous hydropower dams and the infrastructure developed to create the St. Lawrence Seaway, which is one of the world's busiest shipping corridors. Saint John River - is the longest river in Atlantic Canada. Hydropower dams on the river have dramatically altered river flows and contributed to the decline of the Atlantic salmon population that is now endangered. Downstream from the dams, river flows can fluctuate by as much as 91% over a 24-hour period; at times flows are reduced to the point that the riverbed almost dries up. Ottawa River - is severely fragmented by hydropower dams in both the Quebec and Ontario portions of its watershed, the Ottawa is one of the most regulated river systems in Canada. Its natural flow regimes have been dramatically altered, compromising habitat and the diversity and distribution of the river's fish and shoreline vegetation.